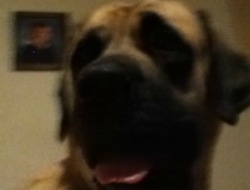 My mastiff, such a noble girl! What about learning how to create a website? Mine would be all about mastiffs. Do you love mastiffs? Are you online seeking information? How about learning how to create your own website and turn it into your first home based business? It would be a great way to share information about your passion AND earn some extra money at the same time. That's my thinking anyways. But first, about mastiffs and their plea. Mastiffs are often used as bait dogs to train pit bulls to attack. If they survive, they are often scarred; not only physically but emotionally. The lucky ones get rescued. These rescues (most often) are non kill rescues. The organizations are often overflowing with dogs, there are people who open their hearts and homes to foster these dogs, but the need for permanant homes continues to rise. Can you find it in your heart to foster or adopt a mastiff? If this is not possible, donations are much appreciated. Imagine the cost of caring for 10-12 mastiffs at a time. Thanks, one day we may meet. P.s. My mastiff loves my cooking, the latest in zucchini and squash, steamed with coconut oil. Sprinkled with italian seasoning!